IDSeal – Give them nothing to steal, with IDSeal. Give them nothing to steal, with IDSeal. Let IDSeal help keep your sensitive information safe and sealed. Always-connected shouldn’t mean always at risk. IDSeal makes getting identity theft protection service fast and easy. IDSeal offers a depth of coverage unparalleled in the market. Whether you need to protect yourself or you have a family to cover, IDSeal has a plan to fit your needs. Protection starts the moment you register with IDSeal! To provide education and innovation in the identity theft protection industry while providing our members with a world-class customer experience. Protection starts the moment you register. We’ll send you alerts and you’ll have access to credit reports and score trackers anytime. We’re your 24/7/365 sentinel in cyberspace. Are you a busy person or have a family with a lot going on in life? Would you love someone to take the lead for your online safety? Other companies check on common points of compromise of your identity. IDSeal goes even further. 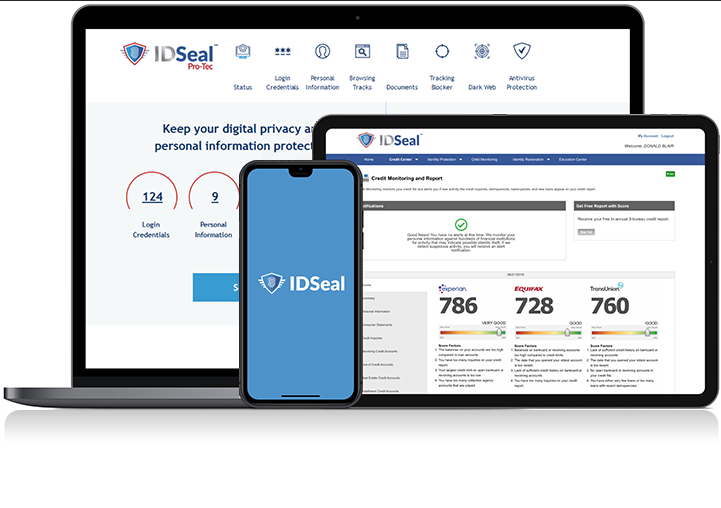 When you sign up for IDSeal, your protection starts immediately. It’s fast and easy to get protected. Simply choose a plan that best suits your household. When you sign up for IDSeal, your protection starts immediately. If your identity becomes compromised, one of our U.S.-Based Fraud Resolution Specialists will help you. It’s like having an advocate at a credit bureau working for you on the inside to help resolve any issues you may have with identity theft. IDSeal will help you replace the contents of your wallet if it is lost or stolen. We will help cancel and reissue all documents that that were lost or stolen. PRIVACY Bonus Resources from IDSeal! Enjoy all the features of the Platinum Plan PLUS these extras to protect your children! "I feel very safe and protected since signing up for IDSeal." "IDSeal has been a complete life changer for me and my family." "I am very happy the services I have received so far." "I love the fact that I could do everything online without having to call in!" ©2019 IDSeal, LLC. All rights reserved. 1It is not possible to prevent all identity theft or cybercrime, or to effectively monitor all activity on the internet. IDSeal cannot and does not guarantee complete protection against cybercrime or identity theft. IDSeal does not monitor the activities of all financial institutions, or all activities of any particular financial institution. Review the IDSeal Terms & Conditions for specific details regarding IDSeal services. 2Identity Fraud Expense Reimbursement with an aggregate limit of up to $1,000,000, and Unauthorized Electronic Fund Transfer/Stolen Funds Loss coverage with an aggregate limit of up to $10,000. Benefits underwritten by Allianz or its subsidiaries or affiliates, including Interstate Fire and Casualty Company. A summary of policy coverage terms, conditions and exclusions is available here. 4The credit scores provided are VantageScore 3.0 credit scores based on data from Equifax®, Experian® and TransUnion®. Any one bureau VantageScore mentioned is based on Experian data only. Please see the IDSeal Terms & Conditions for more information on credit scores.